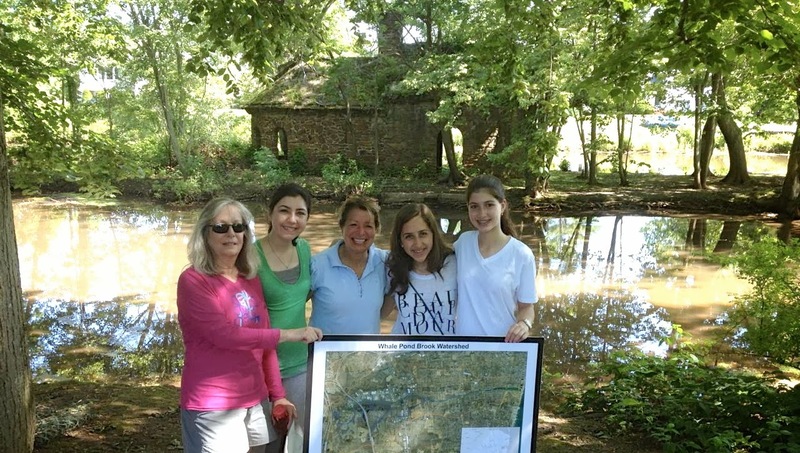 Sophomores, Danielle Ashkenazie, Evelyn Tawil, and Sarah Torgueman accompanied by their teachers Mrs. Hanon and Mrs. Benun participated in an environmental project in Elberon, New Jersey on a Sunday morning during the summer. Faith Teitelbaum a resident of New Jersey, who is also a part of the environmental commission in New Jersey, led this project. The group’s morning began by the Ross Lake of Whale Pond Brook in Elberon. This lake has been hidden and filthy for years with many branches and silt. A small island was discovered to be in the center of the lake after many branches were recently cleared from the lake. On the tiny island, there is a small picnic house that was built years ago by a man named P. Stanford Ross. He owned about thirty acres of land around that picnic house in the late 1800s. Ross was a contractor and was also part of the Essex County Park Commission, which made him very knowledgeable and interested in making parks. He built the picnic house and dammed Whale Pond Brook. Today, Ross’s estate contains many houses and properties that surround his dammed lake. While the group was at Ross Lake, they also learned to identify poison ivy and other flora. Faith taught them that all of the rain water and fertilizer that is drained through the storm drains in that area, pours into Ross Lake, which pours into Takanasee Lake in Long Branch, New Jersey, which pours into the Atlantic Ocean. She also taught them, by showing them a diagram, that it would be extremely effective if many people in the Whale Pond Brook area would make rain gardens. A rain garden is a small garden that is made up of plants that absorb plenty of water. The purpose of a rain garden is to regulate storm water run-off. If many people would make rain gardens, then the pollutants that are usually carried into nearby lakes would be absorbed. The pollutants would not reach nearby lakes, which would save many organisms living in or near the lakes as well as prevent the pollutants from evaporating with the lake water into the atmosphere. Faith told the group that one rain garden wouldn’t help, but many would really make a difference. After they were informed about Ross Lake, they headed to Takanasee Lake in Long Branch. When they arrived they saw remains from a thick cemented wall that was torn apart by Hurricane Sandy. The group was fascinated when they saw a wooden-built dam that allowed the water from Takanasee Lake to flow into the ocean. They observed as the lake water mixed with the ocean water at the weir. It is very important for the lakes’ water to be poured into the ocean because the water would otherwise be backed up into Takanasee Lake. Although the group didn’t get to clean the lake or the beach that day, they became aware of many important ideas that tied into their knowledge of biology. The young women look forward to helping their local environment of New Jersey with the knowledge they obtained from their Sunday morning with Faith. One of the students, Danielle Ashkenazie, recently participated in the Long Branch Clearwater Festival, where she had a chance to meet with Congressman Frank Pallone and discussed her environmental concerns with him. These students were able to develop their interests in and learn more about the environment through the Yeshivah of Flatbush Pathfinders Program. ~Thank you to Sarah Torgueman and Danielle Ashkenazie for their contributions to this post. 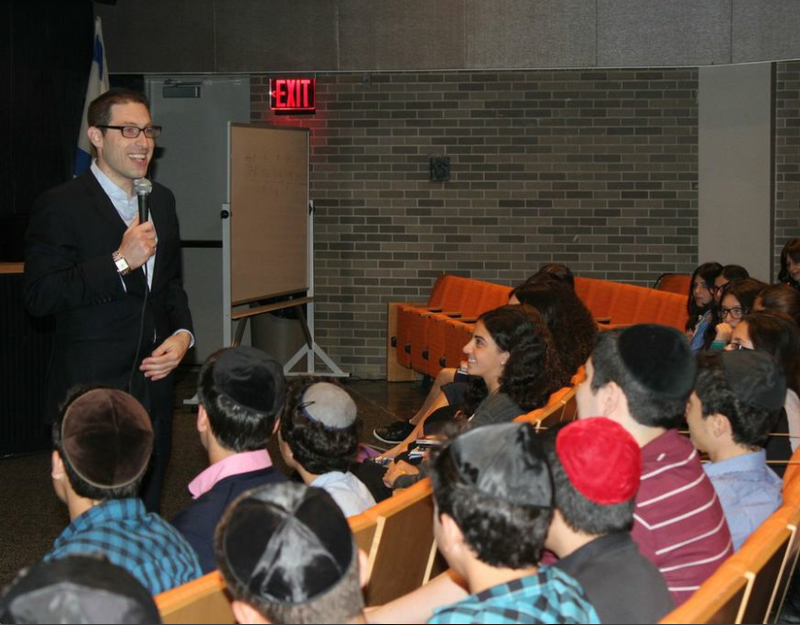 On Thursday, students at Yeshivah of Flatbush Joel Braverman High School had the honor of hosting one of our alumni, Charlie Harary, who addressed the entire student body and spoke about Yom Kippur and our connection to G-d as part of our annual Teshuvah Program. Reflecting on his personal experience, Mr. Harary inspired students and left an impression that Hashem truly cares about every person. He motivated students to look at all events in their lives as an opportunity to make a difference as well as use these moments to better themselves. Mr. Harary also encouraged students to think of positive changes they wanted to make prior to Yom Kippur. Yeshivah of Flatbush Joel Braverman High School faculty member, Rabbi Yitz Rosenblum, commemorates his brother and all the other people who tragically died on September 11, 2001 in this video.